Vic Firth drumsticks are the choice of top players in all kinds of genres. Whether you play rock, jazz, country, pop, or other musical styles, there's a pair of Vic Firth drumsticks made to fit your taste. From their precision manufacturing and matching methods to their amazing product range, Vic Firth offers quality you can depend on, no matter what you play. If you want great sticks at a great price, Remix has plenty of Vic Firth sticks to choose from. Choose the sticks the pros have been depending on for over four decades â€” Vic Firth sticks! This pair of 7A wood tip drumsticks features a teardrop tip. These sticks work well for jazz applications. 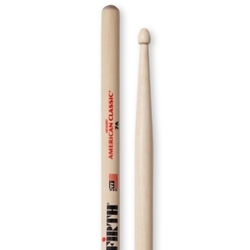 Vic Firth 7A wood tip drumsticks give you great sound and dependable performance at a tremendous value!